A recent landmine explosion near the DMZ proves Pyongyang remains caught in the bad habit of provocations. On August 4, 2015, two soldiers of the Republic of Korea (ROK) lost their legs in landmine explosions at the wire fences in the DMZ (Demilitarized Zone). After several days of investigations concluded on August 10, the ROK Ministry of National Defense announced that the explosions were an intentional provocation by North Korea, and promised severe retaliations: resuming border-area propaganda broadcasts for the first time in a decade. This is the first major military provocation involving ROK casualties since Kim Jong-un took power in 2011. It seems North Korea cannot quit its bad habit of provocations, even though it’s a bad move for Pyongyang. Why can’t North Korea stop provocations? This latest North Korean provocation is likely a deliberate political measure to divert the attention of its dissatisfied military. Since taking leadership in 2011, the Kim Jong-un regime has been pushing for its own policy slogan: parallel economic construction and nuclear arms development, or the ‘Byungjin’ policy in Korean. This means that Pyongyang should concentrate its economic capacity on the nuclear program and on economic development, at the expense of its conventional military. As the military no longer enjoys the ‘military first policy’ of the previous leader Kim Jong-il, that the North Korean conventional military may feel neglected and could eventually turn hostile against the Kim Jong-un regime. In order to divert the discontent of the military, the Kim regime may have needed an outside target that can catch the attention of the military, and this time the target is the upcoming U.S.-ROK combined exercise. The North Korean provocation right before the exercise may prompt a more intense combined exercise, which is a stronger show of force. 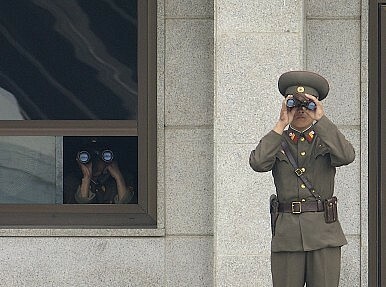 The more intense the drill becomes, the closer the North Korean military will monitor the exercise. As a result, Pyongyang could distract its military with the enemy forces: U.S. and ROK. Despite its intentions, Pyongyang’s provocations cannot solve its military morale problem in the long term, but it will turn public opinion in the ROK against Pyongyang. This time, the landmine explosion caused the ROK to resume its propaganda broadcasts, which highlight how well fed and actively supported the ROK military is, but how poorly fed and ill-supported the North Korean military is. The propaganda broadcasts will greatly demoralize North Korean troops on the frontline, and eventually foil Pyongyang’s effort to channel its military discontent against the South. In addition, constant provocations from the North are gradually silencing soft-liners in the ROK, while empowering hard-liners in the political, military, and media spheres. Although the ROK public generally perceives North Korean as the same race or as divided brothers and sisters, North Korean provocations will ultimately cause the ROK public to see the North as a threat. As ROK society unites itself against a common threat, Pyongyang’s effort to divide ROK public opinion will fail, and more people will support the logic of the hard-liners, which calls for the elimination of the Kim Jong-un regime. Provocations will not help Pyongyang turn domestic military discontent against the South; instead, the North will eventually drive itself into the corner. What should the U.S. and ROK do? U.S. and ROK leadership, and military authorities in particular, should foil Pyongyang’s intent by not intensifying the level of the combined exercise. Unlike in 2010, North Korea did not choose a high-tier provocation such as sinking ROK vessels or shelling ROK territory, because doing so would end in disaster for Pyongyang. Direct, immediate, and somewhat excessive retaliations from the South in response to a high-tier provocation would result in North Korean military casualties. However, as Pyongyang would not want to risk its survival by starting a full-scale war against the U.S. and ROK, it will have to dissuade the military from taking more aggressive actions in response. Then the anger of North Korea generals would be diverted to the Kim Jong-un regime, for not investing in the military and dissuading them from responding to South Korean retaliation. Instead, by using a lower-tier provocation (in this case, landmines), Pyongyang could accomplish two purposes: to upset the ROK without inducing direct and immediate retaliations, and to prompt the U.S. and ROK to intensify their regular combined military exercise in order to induce a higher readiness posture in the North Korean military. By intensifying the drill, Pyongyang could keep the North Korean military busy watching the threat in the South, and thus distract its military from the lack of support provided to them. To avoid playing into Pyongyang’s hand, U.S. and ROK military leadership should not intensify the drill, but execute the original exercise plan with its regular level and size. Holding the combined exercise at its usual intensity would give little excuse for the Kim regime to maintain a higher military readiness posture and would ease the tension against the ROK by turning North Korea’s discontented military back against Pyongyang. Washington and Seoul must make Pyongyang understand that provocations will not work. It is likely that North Korea decided to intentionally elevate tensions across the frontline in an effort to keep a disgruntled military busy against outside powers. Washington and Seoul should not take the bait by intensifying the exercise, but instead foil Pyongyang’s intent by preventing the escalation of tensions on the Korean Peninsula. North Korea’s bad habit must end. Kim Jong-un has rejected an apology from Seoul and ordered his army onto war footing. Why the US Should Rethink Military Exercises With South KoreaHow to Pave the Road to Trump-Kim 2.0North and South Korea’s New Military AgreementSeeing Through the Familiarity of the Inter-Korean Panmunjom DeclarationUS Confirms North Korea Willing to Discuss 'Denuclearization of the Korean Peninsula'. What Now?